It’s difficult to remember a time when each day of the week didn’t have a cute name that encouraged us to drink wine. As though we needed additional excuses to imbibe, social media has hastened the spread of such occasions as Wine Wednesday or Thirsty Thursday. Before it became fashionable to get tipsy mid-week, Friday was the day when the floodgates would open. No special name required. Friday was the word. In this era of alliteration, simply calling it Friday would not do. But what in the wine world will match Friday? Fetească Regală Friday? I think not. I could see there being a Fino Friday, but you won’t want to drink too much given that it’s 15% ABV. Helpfully, the British have an insatiable thirst for sparkling wine and Prosecco in particular. Last year, Prosecco overtook Champagne as the favourite fizz of the UK. Sales of the Italian sparkling wine soared to £182-million compared to £141-million for Champagne. Overall, volume sales for Prosecco amounts to 21-million litres in 2014, with Champagne at 6.5-million and Cava at 13-million. It didn’t take long for someone to name a day of the week in honour of all the sparkling wine we drink. Hence Friday Fizz. But before we all ventured off to Aldi for ration of Prosecco at the start of the weekend, I had a friend who was honouring Prosecco Friday with a pallet of bottles bought from a Mancunian discount store that sold it for so cheap that it made Aldi and Lidl look like Fortnum & Mason. So cheap that you’d be mad not to bathe in it. Except the thing with most Prosecco is that it satisfies that desire for something fizzy, but it doesn’t do much else. And so it can be a real challenge to write anything profound other than to say it’s a crisp, fruity and fizzy means of delivering a desired amount of alcohol into my bloodstream. QED. All of this build-up relates to the fact that, quite a few months back, I was sent a picnic basket containing a fairly useful wool blanket and three bottles of Italian fizz: two sparklers from Piedmont and one Asti Spumante. There was also a Presecco DOC for good measure. Sample bottles from Gancia — okay, freebies. If you read Sediment Blog last week, you’ll know they forgot to taste the sample bottle they were tasting. I can say it’s easy to suffer the same fate. Because in this case, I’ve done exactly the same thing. First, I kept putting it off. I’ll review them another day, I kept saying. The problem is that, in my house, Friday Fizz almost always has a disastrous effect on my Saturday mornings. Opening a bottle of fizz is not the same as opening a bottle of Fino. You don’t merely have one glass and then stash the bottle in the fridge until the following day. No. Fizz is of the moment. Once those bubbles are released, their existence is fleeting. So you open a bottle, drink the contents and then wake up the following day feeling as though someone has hit you over the head with a mallet. I hate to disappoint the folks at Full Fat PR, but my review has been nothing short of a failure. The fizz was superb, but I’ll be darned if I can muster precise tasting notes that go beyond preferring these bottles of Gancia to your garden variety Italian sparklers. It seems none of this will matter all that much, for even though the folks at Gancia announced a big launch into the UK last spring, it looks nigh on impossible to buy in the retail trade right now. Pity. When the folks at Majestic Wine said customers would be able to buy one bottle at a time rather than the previous six, it provoked debate. Was this a bold move to dominate the high street or was it a last-ditch effort to remain relevant in the face of stiff competition? On the surface, Majestic’s long overdue change of business model appears to be the right decision. No more cases of Oyster Bay stacked haphazardly on top of each other. No more requirement to buy six bottles when all you wanted was something to go with your roast. No more confusing pricing where the only way to get the best price was by buying two of everything. From here on, simplicity reigns. Majestic is no longer a dusty warehouse; it’s your friendly neighbourhood bottle shop. Right? Well, not so fast. While Majestic is emphasising its decision to sell by the bottle, its pricing model remains largely focused on selling by the mixed case of six. In the past week I visited my local Majestic on two occasions to buy a single bottle and twice I walked out empty-handed. 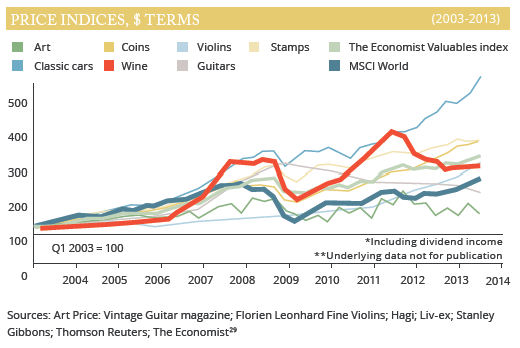 In each instance this was based purely on price. Despite being able to buy one bottle, there is no incentive to do so when the spread between the single-bottle price and mixed-case of six price is so wide. Among the bottles I considered buying at my local Majestic were Nyetimber Classic Cuvee 2010 and CVNE Imperial Reserva Rioja 2009. Majestic lists a single bottle of Nyetimber for £35.99. But if bought as part of a case of six, it drops to £26.98. That’s a difference of £9.01 or 25%. Similarly, CVNE Imperial Reserva Rioja 2009 is listed at £25 for one bottle or £19.99 when bought as a case of six, or 20% less. If buying six bottles at a time, Majestic’s prices aren’t bad. But anyone wanting just a single bottle is being forced to pay a premium. And it’s not as though either of these wines are difficult to find in other retailers. For instance, CVNE Imperial Reserva Rioja is widely available across the UK, for example at Waitrose for £21.99, at the Wine Society for £16.67 (after paying one-off £40 membership fee and shipping if the order is less than £75), £19.95 from Asda and at the Co-operative in the region of £17 based on a recent visit to one of their shops. The price of the Nyetimber is even more telling because it is so widely available. Waitrose sells it by the bottle for £31.99. Slurp does it for £31.95. So too Berry Bros & Rudd. Even high-end retailer Hedonism sells it for £31.50. 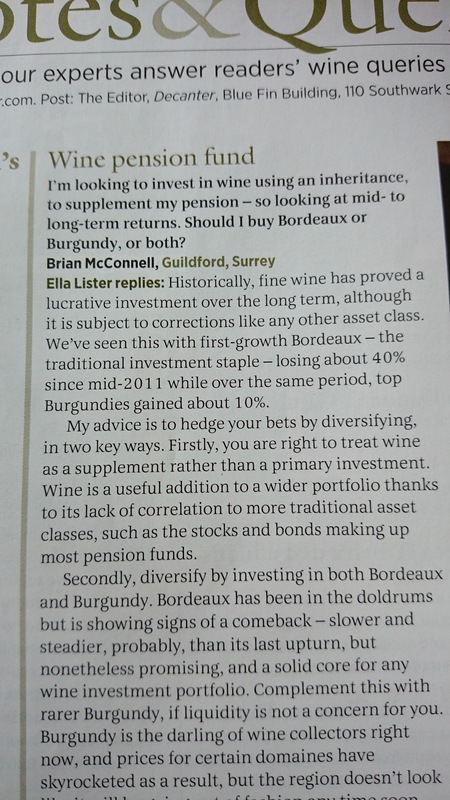 Over at the Wine Society, it will cost £27.50 once you’re a member. And at Amathus, the 2008 vintage is listed on their website at £32.75. I wondered if these two bottles were simply anomalies, so I went onto the Majestic website to do some comparison shopping with randomly selected bottles that are widely available. First up is Villa Maria Private Bin Sauvignon Blanc 2014. One bottle at Majestic will set you back £11.99, but in a mixed case it costs £7.99. At Asda, Tesco and Waitrose, it sells for £9.50. Next is Lopez de Haro Rioja Blanco 2014. At Majestic, it’s £9.99 or £7.49 in a mixed case. If you want just the single bottle, you can find it cheaper at Highbury Vintners, selling for £9. Now, to be fair to Majestic, the next wines that I looked up appeared to be priced in line with competitors. 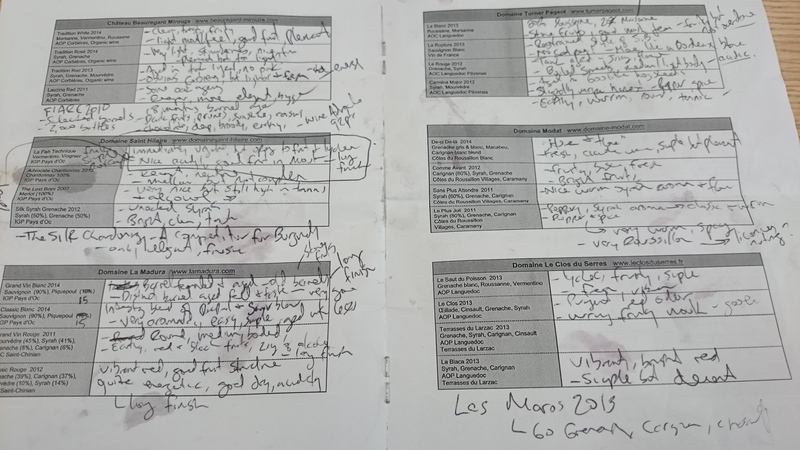 E Guigal Cotes du Rhone 2011, for example, lists for £11.99 at Majestic or £7.99 in a mixed case. At most other retailers, the price was broadly the same: £11.50 from Waitrose, for example. Similarly, Catena Malbec 2013 lists at £12.99 for a single bottle (£9.74 as part of a mixed case), the same price as Waitrose. So where am I going with this? Majestic’s bold change of business model is a clear sign that they are listening to what the market wants, but I’m not convinced that they truly believe in it. 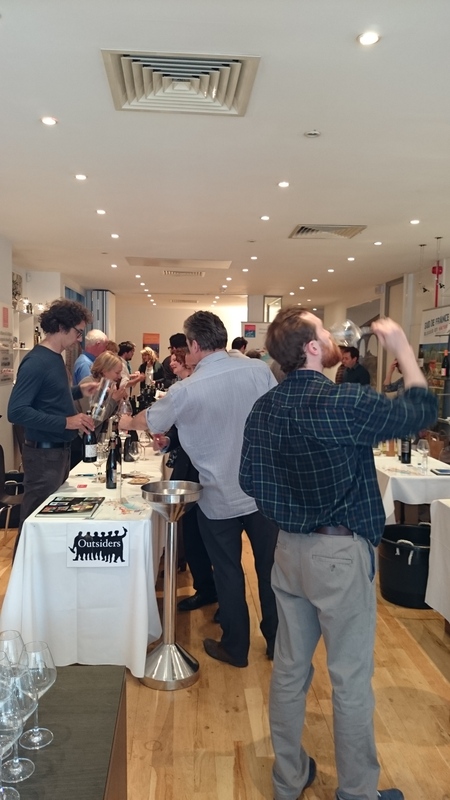 Offering a discount for buying by the case is a standard incentive in the wine trade, but usually it amounts to 5% for six and 10% for 12. Majestic is still using the supermarket tactic of applying deeper discounts of 25% and 33% to wines when buying six at a time, but there is little evidence that they want to be competitive when it comes to some (many?) of their single-bottle prices. On that basis, it seems Majestic is still trying to hang its hat on the concept of selling by six bottles or more by setting the price of a single bottle unattractively high. 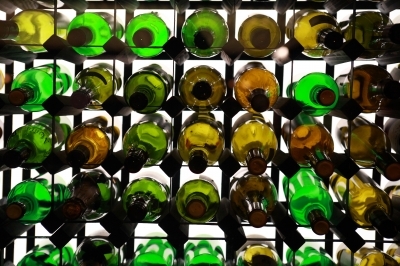 It is doubtful that their stores will attract a raft of new customers looking to buy just one bottle at a time when so much of their stock is sold cheaper elsewhere. 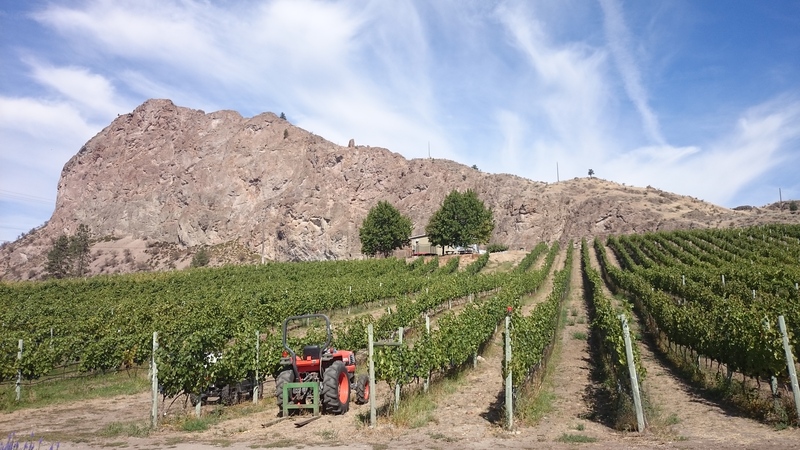 Just when you thought Canada has finally established itself on the global wine map, something crops up that makes it abundantly clear that there is still a long way to go. As the price tag in the photo shows, it seems that not even Marks & Spencer is aware that Canada is a sovereign wine-producing nation – even though Canadian wine is nothing new for the retailer. 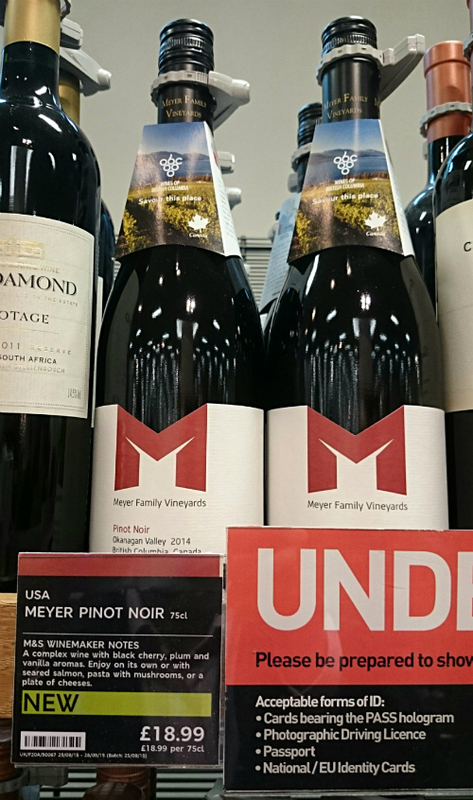 Despite a bottle that clearly states the wine’s origins — British Columbia, Canada — someone in the M&S machine decided to print a run of shelf tags that declare this Meyer Family Vineyards Pinot Noir as a product of the USA. Perhaps the powers-that-be at M&S have decided that the Oregon Treaty of 1846 had a more disastrous outcome for the British, placing the Canada-USA border much further north than its current path along the 49th parallel. How else could they have confused a wine from Canada’s Okanagan Valley as being from the USA? The wine in question is Meyer Family Vineyards Pinot Noir Oakanagan Valley 2014, which sells for £18.99 per bottle here in the UK. Back in September this year when I visited the Meyer Family Vineyards winery in Okanagan Falls, British Columbia, it was, as far as I could tell, still on the Canadian side of the border. Unless something went drastically wrong between then and now, I believe this is still the case. It’s also fairly unlikely that the Americans mounted an opportunistic land grab during the recent election campaign.